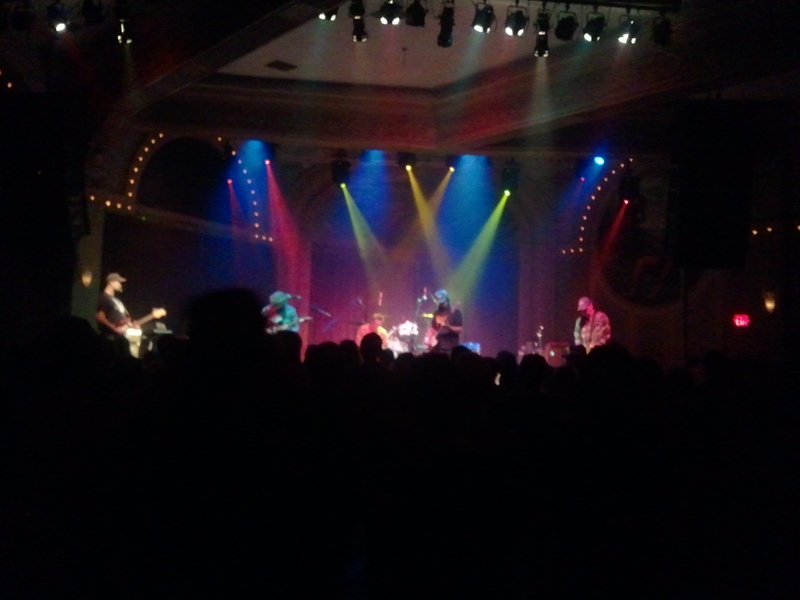 For a number of years, Built to Spill has been afflicted with the same curse as Spoon: consistent quality. Like Spoon, who have released a string of exceptional albums since 2001’s Girls Can Tell, over the last decade-and-a-half Built to Spill have steadily produced a series of very good records since the one-two punch of the classics Perfect From Now On and Keep It Like a Secret made them heroes of the indie rock scene. Both groups have a dedicated fanbase that has passionately welcomed each new release, but to some extent critics have begun to take the quality of the work they produce for granted. At this point, excellence is to be expected. Considering the circumstances, it is remarkable not only how comfortable and laid-back Untethered Moon is, but how neatly it fits within the band’s catalog. In the six years since the release of There Is No Enemy, not only did Doug Martsch scrap an entire album, but longtime members Brett Nelson (bass) and Scott Plouf (drums) left the band. Though it took some time for replacements Jason Albertini and Steve Gere to get acclimated to the group in their live performances, the transition is seamless on the album. It is still true that the most important components of a Built to Spill song are Doug Martsch’s guitar parts followed by his trademark vocals, but the new rhythm section has seemingly injected some verve into the songs and rejuvenated Martsch to an extent, even if relatively few of their individual contributions stand out (the drum fills on opener “All Our Songs” and the bass melodies on “Never Be the Same” serving as notable exceptions). What is most surprising about Untethered Moon is how restrained the guitar-playing is for the majority of the album. Doug Martsch established himself as one of the Guitar Gods of the alternative scene because of his mastery of each fundamental part of the instrument; not only could Martsch rip out a brilliant and searing lead or create a catchy and memorable riff, but he also was able to precisely construct multiple-part epics that not only perfectly integrated those leads and riffs but managed to surprise listeners with their originality. Consider how easily classics like “Carry the Zero” or “Kicked It In the Sun” shift between seemingly disparate sections that are nonetheless tied together by Martsch’s inventive songwriting, and how seamlessly Martsch blended multiple interweaving guitar parts. There are only a few scattered moments that recall Martsch’s previous guitar heroics; instead it is a few select riffs or the occasional quick melody that leaves an impression on the listener. With its tight, concise songwriting and the relative rawness of its fidelity, the closest analogue in the band’s discography is There’s Nothing Wrong With Love from just over two decades ago. It is not as if the band has come full-circle though; they are just digging deeper into their repertoire for inspiration. Untethered Moon lacks a memorable single like the ferocious live staple “Goin’ Against Your Mind” or a cathartic hidden gem like “Things Fall Apart” that are definite standouts, but instead has several strong tracks that will compete to be designated as the listener’s favorite. When the band hits the road in support of the album, fans should look forward to hearing the band incorporate the new material into their live sets without a hitch, though the particular songs chosen may be a surprise. Untethered Moon proves that Built to Spill is a well-oiled machine that keeps chugging along, replacing and assimilating new components without any problems whatsoever, and able to continue to produce quality albums well into their career. Yesterday we ran a piece in which, among other (legitimate complaints), we knocked a band for being “repetitive.” But we want to make it clear that “repetition” itself is not necessarily a problem in music, and in fact in many instances can help enhance a song. For example, repetition can help create a rising tension in a song, as the listener patiently awaits any change that would signify a resolution to the chord progression or drum pattern to which they can finally experience some relief. With “All My Friends”, LCD Soundsystem accomplished this by expertly employing a simple progression of two chords and a relentless drumbeat to keep the listener’s attention over its seven minute running time. Low also uses repetition in their song “Nothing But Heart”, a highlight from their stellar album C’mon, but in a manner that differs slightly from the traditional purpose outlined above. Musically speaking, Low uses a single descending progression repeated several times over the course of the song, but uses this as a foundation on which they can layer on top several other instruments and melodies and musical ideas. That sounds similar to what most other bands do, but the added wrinkle is that Low also does this through repetition in their lyrics. The entire song is only four lines, with the last line repeated endlessly. but you wanna be free. As the listener realizes that the band is not going to deviate from this pattern and instead have fallen into a sort of endless loop or repeating this last line, the phrase “I’m nothing but heart” begins to take on different meanings. It at first appears to be a sort of mantra, but as the repetition continues without fail, the phrase begins to take on different tones. The band plays this up with their vocal performance, embellishing it with different dynamics and points of emphasis. As a result, the band is able to convey several different meanings from the same phrase–over the course of the song, it appears to be hopeful, conciliatory, regretful, bitter, even defiant. Though the band sings the line over thirty times, one can sense that with each utterance that Low intended the listener to feel a different emotion each time. It’s an extremely powerful performance. Oh, and it allows the band to really rock out with some gorgeously jagged guitar solos over the top of it as well. With the release of their eighth studio album Sonic Highways this week, Rust Is Just Right is celebrating with a week devoted to the Foo Fighters. Today we take a close look at their most beloved album, The Colour and the Shape. Last week, one of my friends suggested to me that despite its initial popularity, The Colour and the Shape is “criminally under-appreciated today.” After spending some time contemplating the proposition, I wrote that I agreed with his assessment, while expanding on his point and making some minor modifications. I think most people would agree that it’s a very good album, but I also believe that a majority of those fans wouldn’t even begin to consider TCATS a “classic” or one of the best albums of the 90’s. I would contend that there are a few reasons that The Colour and the Shape is not held up in the same regard as other classic albums of the era. First, the fact that the Foo Fighters are not only a still-functioning band, but have continued to be one of the most successful rock bands of the past two decades, works against them in this case. This prevents an appropriate distance from the album from being formed, so that we as an audience can stand back and reflect on its merits. The Foos have churned out a fairly consistent product over time, with good-to-very-good albums released every few years; there hasn’t been a need for fans to ask “hey, when are these guys going to get back to the formula of The Colour and the Shape” or for critics to say with each review “THIS is their best album since TCATS!” as they do with every Pearl Jam release since No Code. Fans today aren’t rediscovering the bands early work that they missed the first time around like they would with Pavement or the Pixies, as they just get caught up in the normal album cycle; the anticipation that builds up when a band may potentially reunite doesn’t create the same fervor for their early work as a normal album progression does. And with Dave Grohl’s status as the Unofficial Mascot of Rock, even when the band takes time between album releases, their frontman is never far from the public’s consciousness. He’s the modern guy that musicians from all eras and genres call up, from living legends to standouts from the underground,* so we’re always hearing about him teaming up with this guy on this record or performing with those guys on that show. And in an era where there are fewer and fewer rock stars, he’s a consistent source for quotes and interviews–if Gene Simmons says something stupid about the state of rock, you’re damn sure Grohl will have a rebuttal. Fine, I’ll take that cookie. The Colour and the Shape is a brilliant guitar album, first and foremost: it’s packed with memorable riffs and great hooks, and guitars dominate the songs from beginning to end, whether they are electric or acoustic. Fans immediately remember that huge descending riff from “Monkey Wrench”, the delicate strums of “Everlong”, and that killer melody from “My Hero” when reminiscing about the album. Even the deeper cuts are defined by their guitars, from the arena-rock-ready lines “Hey, Johnny Park!” to the sugary-sweet melody of “Up In Arms”. But while these parts are so catchy that they sound easy, there’s a greater layer of complexity to these guitar parts than your standard garage-rock/bar-band fare. The Foos often use unique chords or uncommon voicings, altering your expectations just enough that you can’t predict a progression the first time you hear it but done in a manner that’s not so jarring that it affects your attention. There is another area which shows the technical expertise of the record when you dig in a little deeper. The Colour and the Shape is a Drop-D album that doesn’t succumb to the laziness that is often inherent in the technique. Usually, down-tuning the bottom string invites guitarists to simply crank out a riff and then let the tuning give it a superficial depth, since they can easily turn a single-line melody into a chord by simply pressing one finger over multiple strings (though guitarists deserve credit if they use this convenience to write more intricate riffs than they would otherwise–then Drop-D is used appropriately). Instead, the band uses that tuning to create bigger-sounding chords, using the entire width of the neck and allowing for more individual voices to be heard and more complex melodic lines within a chord progression, and also to create unique chords in and of themselves, as in “Everlong”. The progression itself is not particularly complex, but by using the Drop-D it creates a more unusual and novel chord for each step of the phrase. That means when your roommate picks it out on his acoustic that it is not nearly as impressive as Grohl writing the progression in the first place, but good on roomie for trying to impress the audience with a great song. The album is known to the masses for its big singles, and rightfully so. “Monkey Wrench” was a furious introduction as the lead single, and you can instantly connect with the anger and passion of the band’s performance, especially that all-shouted third verse. “My Hero” with its thunderous and epic intro was the perfect soundtrack to movie climaxes and sporting events, and its simple message of praising the ordinary heroes among us is one we can all recognize. And of course, there’s the monumental “Everlong”, which remains one of the totemic songs of the past twenty years. Even stripped down to its barest elements, just a hushed voice and a delicate guitar, one can feel the power of all the emotions associated that come with the experiences of first love, from the anticipation to the anxiety and everything in between (if the acoustic version has one flaw, is that it cuts out the fantastic bridge from the original electric version, but it’s a forgivable omission). I’m sure someone in the past decade has paired it with My Morning Jacket’s “Touch Me I’m Going To Scream Pt. 2” on a mixtape, and if they haven’t, I want to alert you that you’re missing a golden opportunity. But the true strength of the album is in its deeper cuts, the songs between the tentpoles that defined the album. As mentioned above, there’s “Hey, Johnny Park!” with its huge riffs and its gleeful willingness to toss in all sorts of goofy rock tricks, like slides up and down the neck and amusing manipulations (the effect used for the bridge being the most easily identifiable example), and “Up In Arms” with its catchy melody and the way that it inverts the seriousness of its intro by cranking up the volume and repeating everything in double-time. Then there are other fun tracks throughout that stay fresh after all these years, like the pounding “Wind Up” and “Enough Space” or the gentle bounce of “See You” or the delicate ballad “Walking After You”. But the true standout that all fans of the album would point to is “February Stars”, a song that should immediately rectify any prior misgivings that one may have had about the term “power ballad”. It earns its huge final chorus, and the band makes sure not to waste any of it by piling on layers and layers of guitars playing big, thick chords. It’s not perfect, and I have a few minor quibbles–I’d end “Doll” on the sustained chord instead of resolving it, so as to build tension and use it as a true intro to “Monkey Wrench”, and I’d slide “February Stars” behind “Walking After You”, to provide a more natural trilogy with “Everlong”, creating a better flow between each of the songs as well. But these trivial issues aside, it’s an otherwise unimpeachable record. It’s at its base a simple rock record, just a few guys on guitars, bass, drums, and vocals, but it never feels limited by those potential constraints. And while it may be known for many of its quiet and sweet moments, there is still an edge to the album, and the Foos are never afraid to let loose and crank the distortion up. In that context, The Colour and the Shape shouldn’t be dismissed as a mere mainstream rock record, but should be praised as a quintessential example of the form. It’s not merely a good record, but an all-time great album. *Just consider that Dave Grohl performed in a band with John Paul Jones (Them Crooked Vultures) AND with Paul McCartney, as well as . He’s the musical equivalent of Kevin Bacon–you’ll connect him with anyone from the past fifty years in less than six steps. **That’s not to say that we here don’t tend to prefer less-mainstream fare, but instead that just because it’s obscure it doesn’t mean it’s good, and just because it’s popular, it doesn’t mean it’s bad. Last week, we took an in-depth look at Television’s brilliant debut album, Marquee Moon. As one would expect, we spent a fair amount of time discussing the brilliance of the instrumentals on the album, noting the excellent work of each member of the band beyond the usual praise for the dazzling and intricate guitar. For this edition of Feats of Strength, we’re going to be cliche and examine the band’s excellent guitar-playing, but do so for a song that is often overlooked: the album closer “Torn Curtain”. We briefly mentioned “Torn Curtain” in our previous feature, but it’s definitely worthy of further examination. There is a wonderful dichotomy between the restraint shown by the careful and deliberately paced music and the emotional and expressive lyrics, which are filled with various declarations and descriptions that sound like something out of a soap opera. Consider the memorable chorus, with a reflective and cathartic Tom Verlaine mourning the passing of time with the other members emphasizing the words “years” and “tears”, while accompanied by straight-forward rhythm section that accentuates each beat, with a delicate piano twinkling over the top. Fred Smith anchors the song with a sturdy bassline, with the occasional rhythmic flourish–pay particular attention to his sixteenth-note pickups in the second verse for example–while also providing some necessary counter-melody. Billy Ficca also delves deep into his bag of tricks to loads the song with countless little drum fills and ornaments, beginning from his rolls in the beginning that change pitch with added pressure, to various accents using his ride cymbal to a keen use of his kick drum to accent certain beats. Though there are stellar contributions all around, it’s Tom Verlaine’s solo guitar that stands out, especially his epic finale. Throughout the song, he and Richard Lloyd trade riffs as they build on a simple minor key progression, relying on elliptical licks and strategically-placed open strings to subtly color the chord changes. Verlaine has a nifty little solo that does a good job bridging the second and third chorus, but its true greatness is the fact that it foreshadows a second, more gorgeous solo after the third chorus. Initially, it seems like the song will end after the third chorus, but Tom gradually begins to improvise around the lead lick introduced in the third chorus. He steadily picks up steam as he incrementally makes his way up the neck. As Verlaine works his way up the scale, he ratchets up the tension both by spending more time on each step and by increasing both the number and sweep of each bend. The listener keeps waiting for the natural resolution of the solo, but Verlaine keeps delaying his march to the summit, until he finally hits the peak on a last gasp series of bends (6:20-6:23). But right when he gets to the top, Tom abruptly breaks the tension by creating the illusion that his string has snapped, suddenly dropping to the bottom of the neck with a jarring riff using his bass strings. It’s a stunning moment, and the result is a unique tone that’s instantly memorable; whenever I think of this song, this is the part that I think of instantly. And despite this “drawback”, as the song fades away, Verlaine valiantly tries to make his way up the neck again. When looked at in its entirety, it is then easy to see the guitar solo as a metaphorical depiction of persevering through various obstacles, even when one falls down the mountain, mirroring many of the themes of the lyric. The solo also should serve as a lesson for aspiring musicians, as it’s proof that it’s not necessarily the notes, since the solo revolves around a fairly basic scale, but the rhythm and the touch that are most important. That’s where a musician truly conveys his emotion; a decent melody is nice, and can result in a reaction from the listener, but without the right rhythm or touch, they will never make a true connection with the audience. It is October, so that means it is time to analyze and celebrate one of the great Halloween albums of all-time: Television’s Marquee Moon. Many of you are probably confused by that particular claim, but don’t worry, we’ll get back to it and explain ourselves in a bit. There is no argument however that Marquee Moon is one of the greatest guitar-rock albums of all-time, but in addition to that distinction, it can also be argued that the album is capable of bending the rules of time and space itself. How else could a band that was on the vanguard of the Punk movement have created the seminal Post-Punk masterpiece with their debut album? It is a conundrum that should puzzle both music historians and physicists alike. My first experience with the band Television was back in high school, during my initial forays into exploring the origins of punk rock. I read several articles and books that discussed Television’s history and their influence on the New York punk scene as one of the original CBGB’s bands, and I quickly set out to track down copies of their first two records. (Let us all take some time to acknowledge the fact that I approached punk rock in the nerdiest manner possible: research.) There was one specific aspect of Television’s music which each piece emphasized that captured my attention, and that was the band’s masterful guitar-playing. Being a budding guitarist myself, it was clear that it was vitally important for me to listen to these albums to help develop my own skills. As a child of the 90’s though, I was completely unprepared to process Television’s approach to the guitar: a heavy emphasis on the treble strings (and no power chords), intricate but decidedly unflashy solos, and little-to-no distortion (at least of the kind with which I was familiar). It all seemed so alien to me, and considering the portrait of the band that made up Marquee Moon‘s cover art, this may not have been a bad guess. Most puzzling of all to my adolescent mind was how this pleasant if slightly bizarre album could be considered “punk” (it was a hopeless endeavor at that time to begin to comprehend what the hell “post-punk” could be, beyond the most literal definition, so that was not a pressing concern at the time). But after several repeated listens and a gradual appreciation of the context in which the band flourished, I came to understand that even if there seemed to be little connection to The Ramones on the surface, they were both made up from the same basic DNA and were a reaction to the same movements in music. The musical parts of “Friction” may have been much more complex than “Blitzkrieg Bop”, but one could easily see that both songs were stripped down to the barest elements in contrast to the bloat of prog or disco. Television proved that “punk” didn’t have to mean “easy,” as each member of the group was an expert on his instrument. The twin-guitar attack of Tom Verlaine and Richard Lloyd has been universally lauded, and rightly so, but their other two bandmates should be given their proper due as well. Fred Smith crafted some amazingly beautiful bass lines, shifting between providing an impeccable rhythmic foundation and creating innovative counter-melodies, and Billy Ficca was a genius behind the kit, anchoring the songs with intricate rhythms and delicate textures, effortlessly shifting between different patterns and providing the perfect accents to each musical phrase. As for Verlaine and Lloyd, it should be apparent how they inspired generations of guitar players, from the early post-punk of bands like Wire to contemporary indie rock bands like The Strokes. They were a perfect tandem that fed off each other beautifully, alternating between unique chord choices and lyrical solos, interspersed with bits of brilliant one-off figures and licks. The centerpiece of the album is the title track, an epic monster clocking in at over 10 minutes (Fun Fact: on the original vinyl edition, the song faded out before it hit ten minutes, but the CD version keeps the original recording intact and includes the full version, while still listing the vinyl running time of 9:58). Its intro of dueling guitar riffs (Lloyd providing the double-stop alarm-type bit, Verlaine the countering quick swirl) is instantly memorable, but also merely a hint of what is in store. The verses give way to an instrumental pre-chorus that shifts the song into something much more rhapsodic and cinematic with its winding guitar lines, followed by a chorus that gradually increases the tension with its ever-escalating chord changes. Lloyd’s guitar solo after the second chorus is a master class in terms of both beauty and efficiency, with its mirroring of the melodic structure of the chorus accompanied by some gorgeous personal flourishes. But it is the second, much longer solo by Verlaine and its accompanying full-band instrumental section that is the real show-stopper–the solo provides a brilliant example of how an improvised, meandering take can help ratchet up the tension, and the constantly-ascending full-band breakdown pushes the song to its limits. Lloyd eventually joins in, and the two guitars overlap into similar winding lines, until the whole band suddenly becomes a single cohesive unit as they dramatically repeat in unison a series of sixteen eighth notes. As the band makes its way up the scale, cracks begin to form in the union, as the drums begin to approach a frenzy and the bass peels off with some additional flourishes, gliding up and down the neck. But together the band pushes the melody to the very top, culminating in a gorgeous explosion as the summit is reached, with little guitar twinkles helping add to the effect. Even to the untrained ear, it is clear that from the music alone “Marquee Moon” is a special song, but now consider the instrumentals in conjunction with the intriguing and mysterious lyrics. “I remember how the darkness doubled; I recall, lightning struck itself. I was listening to the rain; I was hearing something else.” The imagery of those first two lines captures a wonderful sense of dread, first with the description of an ever-enveloping darkness, followed by the contrast of the light cutting across the dark. The lines also baffle the listener as well, as he/she contemplates the physical possibilities of how lightning can strike itself. The next two lines help set up the listener for an uneasy scene, as things may not be what they seem: amid the rainstorm lurks an unknown…something. It’s the perfect opening for a horror story! The other verses support this interpretation, first with the meeting with the strange man down at the tracks, whose seemingly perceptive advice of don’t succumb to either the highs or lows of life taking on a darker edge when placed in context with the rest of the song, followed by the scene in the third verse of the Cadillac pulling from out of the graveyard, grabbing the narrator, driving back in, and throwing the narrator into the graveyard. Spooky stuff. After this scene is the long instrumental section, which can be interpreted as the narrator’s journey through the graveyard, with the culminating unison riff being the aural equivalent of the Big Reveal in a horror movie of the Monster or the Terror. The song ends with a repeat of the first verse, which could indicate either that time has looped back on itself (much like how a “post-punk” classic can also be created at the beginning of the punk movement), or that underneath what seems like a restoration of what’s normal lurks a dark undercurrent. Long story short, I am ready to declare that the narrator has become a zombie. It is clear then that “Marquee Moon” is a perfect Halloween song, but what about the rest of the album? The song is not only the centerpiece of the album in terms of track placement, but it also serves as a showcase to a lot of the musical ideas that are the connective tissue of the record. The double-stop guitar figure is given a slight variation in the very next song, “Elevation”, for example, and “See No Evil” is the title of the opener, which makes the horror themes even more apparent! It is also simply difficult to disconnect the song from the rest of the album, as each song flows beautifully into the next. Television also provides wonderful bits of dark humor throughout Marquee Moon, perhaps best exemplified by the song “Venus”. I was hoping that because of the lines “Then Richie, Richie said: ‘Hey man, let’s dress up like cops. Think of what we could do!” the song would find a place somewhere in a movie that came out this summer, but that didn’t turn out to be the case. Instead we will have to strike out on our own to consider the subtle beauty of the explanation that “I fell right into the arms of Venus de Milo” (a line that took far too many listens for me to realize the irony inherent in the claim), instead of having it soundtrack a scene of crazy hijinks. Marquee Moon is simply an exquisite and dazzling album through and through, with each of its eight songs a classic in its own right. Perhaps the greatest example of the beauty of the record is the underrated closer, “Torn Curtain”. The ballad is filled lyrically with melodrama and over-the-top emotion, but is balanced by a delicate and nuanced restrained musical accompaniment, before the two components become intertwined with a triumphant final guitar solo that provides the perfect conclusion to the album. But the album is more than just brilliant guitar compositions; as I mentioned before, there are plenty of fantastic bass lines and stunning drum parts throughout the entirety of Marquee Moon. So listen to the album a few times to get a feel for the beauty and majesty of the guitar, spin it a few more times to pick up on the intricacies of the rhythm section, and then repeat it again a few more hundred times–because even though the album is nearly forty years old, it will never get old. We were excited to wake up this morning to the news that Wilco had announced that they are releasing the box set retrospective Alpha Mike Foxtrot: Rare Tracks 1994-2014 on November 17th to mark the band’s twentieth anniversary. Not only were we thrilled about the news itself, but we were glad to see that we had an even better reason to feature Wilco in our Feats of Strength series. This time, we’re taking a closer look at one of their greatest songs, “At Least That’s What You Said”. My first encounter with Wilco was during the Yankee Hotel Foxtrot era, when they became a cause célèbre after they were dropped by their record label for making a difficult album, a decision which backfired for Reprise when YHF became a huge critical hit and brought the band their widest audience yet. However, after downloading a copy and listening to it a few times, I was unimpressed; that’s what happens when you read too many breathless music periodicals that tag the band with labels like “The American Radiohead”. Expectations were simply too high, and I just ignored everything Wilco for the next few years. A few years later, while I was back home from college for winter break, I was perusing the aisles of my local favorite record shop, when I was suddenly captivated by the strains of a blistering guitar solo coming out the store’s speakers. I stopped picking through the albums for a moment and stood there, waiting for the song to finish, before walking over to the owner to ask who had just played this magnificent solo. “Hey man, I just threw on Wilco’s new album. Have you heard it yet?” I was stunned, and immediately (1) reversed my opinion about the band and (2) went and found a copy of A Ghost Is Born and added it to my stack for the day. The song is split into two halves: a tender piano ballad that gives a glimpse at a moment of potential reconciliation for partners in a painful/abusive relationship and an epic instrumental section let by an ever-building guitar solo. The two parts are delineated by an electric guitar that cuts in right at the two-minute mark, which introduces the major thematic melody, followed by the band joining in on a series of repetitive quarter-note hits. The guitar then switches back to the dominant melody, and the instrumental section begins in earnest, and the true fireworks of the guitar solo begins. It’s at this point that the guitar begins to go off the rails in a bit of barely-contained chaos: at first, the guitar pauses every few measures to go back to repeat different variations of the melodic theme, but then it breaks free from this artificial constraint to let loose some aural pyrotechnics, before one final frantic return to the melody, before slowly dying away with a careful, pulsating tremolo bar dive, as the piano creeps back in. Many listeners have noted the similarities to Neil Young, especially from the Crazy Horse era, and in many instances the guitar captures both a similar tone and style to Young. One can hear echoes of the winding melodies of “Cowgirl In The Sand” and the rich reverb of the lead guitar of “Like A Hurricane” (note specifically the section at about 4:15 in the song), and the focus on microtones and other near-notes in the solo also is a callback to Young’s signature technique. The notes individually don’t all make sense, but when constructed as a whole, you certainly feel all the possible emotion that the guitarist is attempting to wring out. What is perhaps most notable about this is the fact that the guitarist in question is Jeff Tweedy. Even though he has been one of the few constants in Wilco throughout its history, Tweedy never really got the credit as a pure musician as he deserves. In the early years, he was always compared to his musical partners (Jay Bennett in the early years of Wilco, Jay Farrar from the Uncle Tupelo years), and with the lineup that was hired to tour A Ghost Is Born, he had quite the set of ringers helping him out, including the amazing Nels Cline on guitar (just take a listen to “Impossible Germany” and you will immediately have a deep appreciation for the man’s amazing talent). But it’s Jeff Tweedy who handled all the lead guitar in the studio for Ghost, and he’s never really received his proper due for his work throughout that album; his work on “At Least That’s What You Said” alone should place him on those periodic “Best Guitarists” lists that run every six months or so, but a lot of writers seem to forget who was behind the six string on that one. The element that makes the solo work is not the technical mastery (though the incredible skill involved should definitely be acknowledged and admired), but Tweedy’s ability to imbue each note with an incredible amount of emotion, each pitched in a way so as to complement the story that he’s trying to tell. He’s compared the instrumental half to an anxiety attack, and within the context of the song, the metaphor makes sense. The slow build-up, the gradual unraveling, the repetition of the same phrase–they all mirror a spiraling out of control, though fortunately a calm is restored by the end of the song. It’s an impeccably crafted solo in all aspects, and yes, it really rips live. In some ways, Built to Spill is an odd choice to be a part of a festival put on by a beer company. 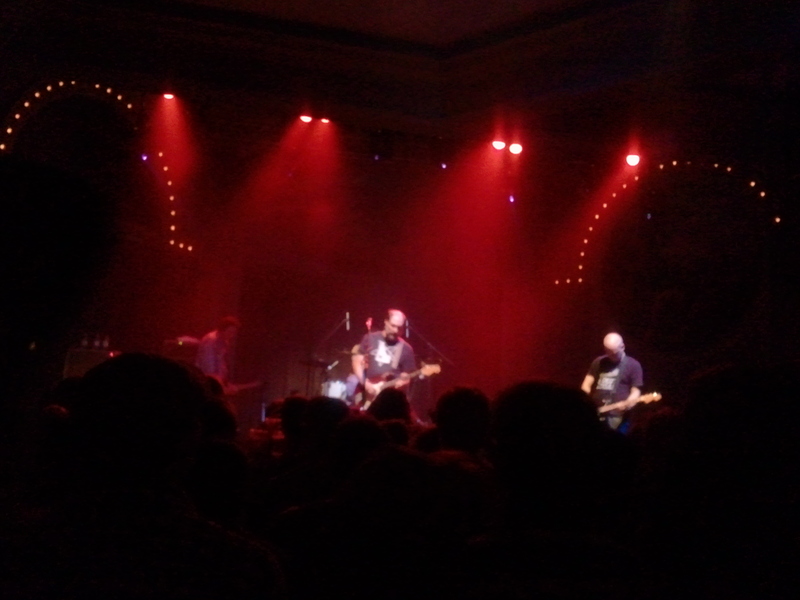 A Built to Spill show is not intended for the casual music fan who’s out on the town looking for a fun night out with the music as mere background to other items on the agenda. The band’s focus is not on spectacle, but on recreating dense, complex works of Guitar As Art for a devoted and appreciative audience in as professional a manner as possible. Even fans can find themselves lost as the group delves deep into an extensive catalog of originals and various covers. In other words, there would be no shilling for corporate sponsors, or mentions of alcoholic beverages; Doug Martsch would punctuate a song with a simple “Thanks”. Though technically a part of the Project Pabst festivities, it is best to think of Saturday night’s show as a stand-alone gig–the chance to see one of the great indie rock bands for over two decades in a locale that while not home, is close to it, for the low price of only $25. As weekend entertainment options go, it was probably the best bang you could get for your buck, and that’s before taking into account the quality of the actual performance. With a setlist that danced all around their extensive career and a lineup in which the new parts are now seemingly fully assimilated, the band ended up performing their finest show that I’ve seen in years. It’s not a bad idea to start things off with one of the greatest album openers of all-time, and the band obliged with a furious rendition of You In Reverse‘s epic “Goin’ Against Your Mind” in all its solo-filled glory. The band then dipped into the early years with two cuts from There’s Nothing Wrong With Love, “In the Morning” and “Stab”. A riveting performance of “Liar” followed, complete with the trademark Doug Martsch head-swivel, as well as a rousing version of “Sidewalk” which got the crowd bouncing. The middle of the set featured my first encounter with “They Got Away”, a reggae-inspired song that the band had released a few years back on a single that I didn’t even know existed; I had been anticipating new material as the group had been working on a follow-up to There Is No Enemy for some time, but instead I had to settle for a song that ended up being just “new-to-me”. Speaking of that album, a personal highlight was the gorgeous ballad “Life’s a Dream”, whose climax really sizzled live. I’m still hoping to catch a live performance of the devastating “Things Fall Apart”, though. The last time I caught Built to Spill it was at an intimate show at the Doug Fir where the group was incorporating a new drummer and bass player. The guitarists were all predictably great, but the rhythm section was hesitant and looked rather bored; part of this could be attributed to a setlist that consisted of seemingly easier songs so as to gradually incorporate the new members. However, there was no such caution with the material at Saturday’s show, and the two new guys sounded as if they had been a part of the group for years. The show ended with slow-building classics “I Would Hurt A Fly” and “Time Trap”, and though we were warned the latter would be the last song of the evening, we were thrilled when it unexpectedly merged into old favorite “Car”. It had been nearly a decade since I saw that song live, and goddamn did it feel good to hear it again. That said, hopefully it won’t be another decade before I see it again.